During my medical career I have treated a number of terminally ill patients who were on the verge of death. Some of these patients described their bizarre experiences when they faced clinical death. Yet I don’t know these experiences were resulted by hypoxia of the brain or due to any other psycho-physiological reaction. Death is the cessation of all biological functions that sustain a living organism. According to the medical practitioners, death has two stages: clinical death and biological death. In clinical death a person’s heart beating stops with the blood circulation. Clinical death is reversible and these vital functions can be restored with timely appropriate interventions. Biological death can occur if clinical death prolongs to four to six minutes. Then the brain cells die from lack of oxygen. In this condition irreversible biological death occurs. Near death experiences were common with those who have encountered clinical deaths. These experiences are unique and every religion has different interpretation for the NDE. It is a subjective experience and many NDEs depend on the education level, cultural factors and religious beliefs. Therefore it cannot be defined as a universal experience. But there are a number of common elements associated with NDE such as out of body experience, travelling through a tunnel, floating, and levitation, seeing a light etc. This is a phenomenon that has to be scientifically investigated by the researchers. Latest research on NDE has revealed some neuro-physiological reactions occurring in the brain Carr (1982) has suggested that NDEs are the result of stimulation of the hippocampus by endogenous endorphins. The stresses of dying certainly generate ‘~natural opiates,” such as enkephalins and endorphins, and enkephalins have been documented to inhibit neuronal discharge within the hippocampus. This theory proposes that increased endorphin levels disinhibit the hippocampus, as well as lowering the seizure threshold within the temporal lobe, and that NDEs are the result of limbic lobe and temporal lobe seizures (Morse, Venecia& Milstein, 1989). According to the University of Michigan researcher George Mashourhighly synchronized brain activity had been reported in dying rat brains when those were undergoing asphyxiation. They further report that nearly 20 percent of cardiac arrest survivors report having a near death experience with visions and perceptions. In 1989 when I was a medical student at the Vinnitsa National Medical University l in Ukraine I first encountered the phenomenon of NDE. I was studying Internal Medicine under the Professor Olga Alekseevna and taking a medical history from an old female patient. Suddenly she went in to a trance and muttered some words. She was looking at something or someone over my shoulder. I turned my back, but no one was behind me. Then she rolled her eyes and fainted. Immediately I called Professor Olga Alekseevna. We tried to resuscitate her. But she died within a few minutes. Up to date I am puzzled of her final vision .did she see someone before her death? Was it real or a hallucination? When I was studying under the renowned Psychiatrist Professor Lyudmila Wavskaya , she once presented a female patient who took an overdose of valium to commit suicide. This young woman narrowly escaped death. Later she told us that while her journey towards death (means her suicidal attempt) she was disconnected from her body and she met the Devil. She flamboyantly described the devil’s image. It had a large horrific face and large eyes and a horn. But later I realized that her decryption of the devil was similar to the devilish figure that was described by Alexander Pushkin in his novel – Eugene Onegin. Unsurprisingly she had read Eugene Onegin novel and when she was under a psychologically distressing situation she coincided this image that was deposited in the unconscious mind. In 1993 I was doing my familiarization at the Colombo South Teaching Hospital under the Consultant Physician Dr S.D Fonseka FRCP. There I spoke to a patient who has had a cardiac arrest a few weeks ago and survived miraculously. He described his near death experience. According to him it was a null experience. He told me that suddenly everything became dark and then he had no sensation. He had no sense of time and space. When he opened his eyes (that was after 48 hours) he was in the ICU. For nearly 48 hours he had no idea or sense of self or sense of time. It was empty and dark experience without any feelings or perceptions. During my Internship period at the Matale Base Hospital I witnessed deaths and dying. I worked under the Consultant Surgeon Dr. S.P Welgama. In his ward we treated a patient who was diagnosed with cancer. The patient was terminally ill and we knew that the death was evident. He was semi conscious throughout. One night his condition became bad. A few minutes before his death the patient woke up , took a pen and paper from his drawer and wrote a short note to his daughter: I am going to die please don’t cry. Then he died. He was conscious and rational at the time of his death and did not show any unusual reaction. In 1996 I worked as the medical officer in charge of the Kollongoda Rural Hospital in the Minipe region. There I treated a number of snake bites. Once a farmer was brought with a russell’s viper bite. His condition was critical and I arranged the ambulance to transport him to the Kandy Teaching Hospital. But he died before we took him to the ambulance. A few minutes before his death he pointed his finger to the hospital wall and said: There are some people who are waiting to take me. He had fear in his face. He was continuously looking at the wall. But there was no one we could see. Was it a hallucination? Was it due to a deeply embedded idea that in death bed strangers come near you to take you from this world? I don’t know. I am still searching for answers. I was trained in Anesthesia by Dr. Priyangani Ariyarathne ” Consultant Anesthetist at the North Colombo Teaching Hospital and worked in the ICU (Intensive Care Unit) and in the operation theaters at the North Colombo Teaching Hospital and in Chilaw Hospital. During this time period, I witnessed strange behavior patterns among the patients who faced imminent death. Once a young patient at the ICU died so restlessly as he was surrounded by invisible people. Perhaps these reactions occurred due to fear; anxiety and medication. In 2003 when I was working at the Military Hospital Colombo I was referred a patient with posttraumatic epilepsy by Dr S.S Jayrathne FRCS for psychological therapies. He sustained a head injury due to a mortar blast injury in the Operation Jayasikuru (Operation Victory Assured) and later suffered from headaches and uncontrollable anger. He vividly described his NDE when he sustained the head injury. I heard a loud noise and realized that it was a mortar attack by the LTTE. Suddenly I found that I was bleeding from my head and I fell down. I could hear the gun fire and blasts sounds. There was a dark smoke. The next thing I realized was that I was going out of my physical body and floating. I was going up and I could see the battle field. I saw bunkers from above, saw dead bodies and the black smoke. But I did not hear any sounds. It was a sensational feeling and it was very peaceful. I saw my body down there near the bunker and I could identify it easily. I saw bleeding from my head. But I felt no pain. Suddenly I wanted to join with my body and rapidly I came down. Then I felt pain in my head and heard the sounds. I opened my eyes. I was lying on the ground helplessly. After sometime a group of soldiers came and took me to the hospital. I wish I could stay up there without joining the body. It was so peaceful there. This soldier’s narration was witnessed by Dr S.S Jayarathne FRCS and Dr N.K Ariyarathne Consultant Physician of the Sri Lanka Army. Still I cannot find a suitable explanation for this soldier’s uncanny experience. NDE has become an unexplained mystery. My experiences with the patients have driven me to seek answers. I spoke to numerous experts on this subject. I had lengthy discussions with Professor Guy Proulx of the York University on NDE. Professor Guy Proulx is a renowned Clinical Psychologist in Canada. His thoughtful knowledge in Neuropsychology has explained some of these unique experiences. But still there are some unanswered questions. NDE is still a puzzle for us. We don’t know what exactly occurs in a mind of a person who has faced the shadow of death. 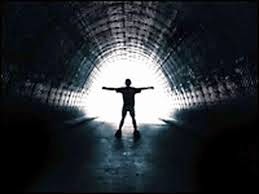 May be within another ten to twenty years the researchers will decode the mystery of Near-Death Experiences. Carr, D. (1982). Pathophysiology of stress-induced limbic lobe dysfunction: A hypothesis for NDEs. Anabiosis: The Journal of Near-Death Studies, 2, 75-90. Moody, R. (1975) Life After Life. Bantam Books. My first visit to your blog. Looks like a treasure trove that needs to be read leisurely, not certainly in a hurry. The NDE is very much connected to the religious and cultural beliefs as you said. The ones who believe in reincarnation and ones who don't could have different versions of NDE. I once read a book titles "The Dead are Alive" which made me think very much about this subject for a long time. And did you read about kathandarakaarayaa's NDE? He once wrote about that in his blog. මට ඕනේ සිංහලෙන් කමෙන්ට් එකක් දැම්මොත් මොකද වෙන්නේ කියලා බලන්න. There is an interesting lecture by neuroscientist and author, Todd Murphy (in fact this is the first of a series of six lectures by him). Following is the link to that lecture in the Youtube. It is a very interesting lecture although it was about 1 hour and 45 min. long.
" It covers visions of God, Near-Death Experiences, and other themes in neurotheology, the field that integrates neuroscience and spirituality. This is the first of six lectures on Spirituality and the Brain by the inventor of the 8 Coil Shakti and the Shiva Neural Stimulation system, which duplicates the procedures used in the God Helmet experiments. He has been a member of Laurentian University's Behavioral Neuroscience research group, under the direction of Dr. M. A. Persinger, since 1998. See http://www.spiritualbrain.com"
This is very interesting. This is what I have read years back. Hope you find interesting.